The CRLA Monograph, Starting Up A Learning Assistance Center: Conversations with CRLA Members Who Have Been There and Done That, will be available soon from H & H Publishing. Edited by Frank Christ (University of Arizona), Karen Smith (Rutgers University), and Rick Sheets (Paradise Valley Community College), the monograph includes conversations with Elaine Burns (Skyline Community College), Frank Christ (University of Arizona), Gwyn Enright (City College of San Diego), David Gerkin (Paradise Valley Community College), Gene Kerstiens (formerly El Camino College), Georgine Materniak (University of Pittsburgh), Martha Maxwell (formerly University of Maryland and UC Berkeley), Reed Mencke (University of Arizona), Sylvia Mioduski (University of Arizona), Michael O'Hear (Purdue University), Karen Smith (Rutgers University), Rick Sheets (Paradise Valley Community College), and Frank Torres (Cal Poly University Pomona). These CRLA members, all experienced learning assistance center directors, look at such learning center topics as professionalism, faculty and administrator concerns, programs for special populations, management tools, student assessment, program evaluation, staffing and staff training, , technology, and program and services standards. An extensive bibliography of over 100 references for further reading are included in the monograph. WCENTER is a listserv (e-mail discussion list) for people interested in writing center theory and practice. The listserv was established in April of 1991 when Lady Falls Brown asked Fred Kemp to create it in Spring 1991. Dr. Brown has been the listowner and administrator. In April 1994 Dr. Brown received the Outstanding Service Award from the National Writing Centers Association for her work with WCENTER. The mission of WCENTER is to provide a virtual space where writing center practitioners, administrators, and consultants can share information about writing center work. Discussions include administrative issues, data collection, tutor training, professional development, and other issues of interest to Writing Centers professionals. To contact the list owner, click here. Dr. Smith has a long and outstanding involvement with learning centers. It started in 1975 when she designed, developed and directed the Center for Learning Assistance at New Mexico State University. In 1988 she designed and directed the Educational Resource Center for Tulane University. And in 1992, she designed and initiated the LRCs at Rutgers, the State University of New Jersey. Today, Karen supervises six LRCs on 3 campuses. These LRCs provide services to over 15,000 students each year. Karen also supports two websites, one for the LRCs (http://lrc.rutgers.edu) and one for all academic support programs (http://pass.rutgers.edu). In addition to designing learning centers for her colleges, Karen served as a consultant on the design and development of other learning centers including Arizona State University, Boston College, the Naval Academy, and SUNY-Binghamton. As part of her commitment to professional development, Dr. Smith served as the past president of CRLA, was Chair of the Past Officers Council, has served as the CRLA Archivist since 1986, and participated with the organization in many other functions and roles. In March, Karen will be honored at the NADE conference in Biloxi and inducted as one of twelve founding Fellows in Learning Assistance and Developmental Education. The Learning Assistance Review is a publication of the National College Learning Center Association (NCLCA). The journal seeks to expand and disseminate knowledge about learning centers and to foster communication among learning center professionals. Readership includes learning center administrators, teaching staff, faculty, and tutors, as well as other faculty and administrators across the curriculum who are interested in improving the learning skills of postsecondary students. The journal publishes scholarly articles and reviews that address issues of interest to a broad range of learning center professionals. These include articles about program design and evaluation, classroom-based research, the application of theory and research to practice, innovative teaching strategies, and student assessment. You can also email Heather by clicking here. “Meeting the Challenges and Serving as a Beacon for the 21st Century"
March 15-19, 2000 in Biloxi, Mississippi. If you know the name of the file, you can type it in the "Named" text box, otherwise, leave this empty. 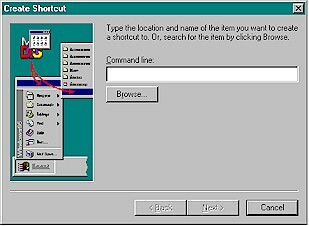 If you know the drive where you saved the file, use the "Look in" pull down menu to select it. Otherwise, select "All local hard drives". If you know the folder, you can click on "Browse" to select it. Make sure you check the "Include subfolders" check box to search all the folders in the drive or directory you select. 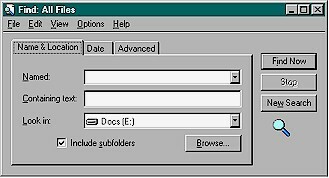 If you remember when you created the file, modified it, or even just accessed it, you can click on the "Find all files" option button, then use the pull down menu to select one of the options: Modified, Created, or Last accessed. 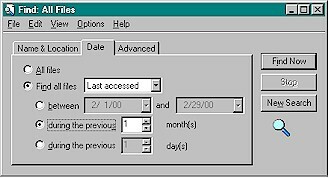 Next select the approximate time period either by entering the start and end dates, or by selecting something like "during the previous" x months. Most likely you know what type of file you are looking for. You can use the pull down menu on this page to select the file type. The other boxes are for entering the file size, which in most case you will not know. To launch this file, you can double click on it. 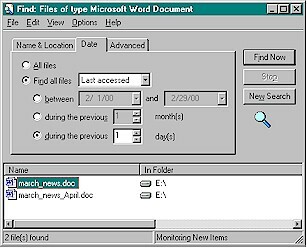 You can even go to the folder containing the file with the Windows Explorer by selecting "File - Open Containing Folder" from the menu. 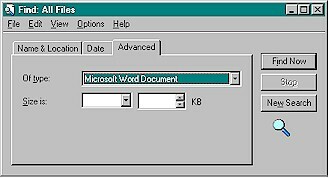 Other options allow you to print the file directly or to send it to your floppy drive or fax. 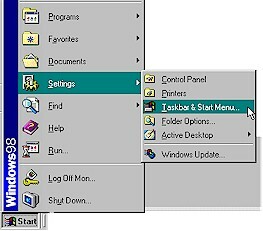 Now every time you start windows this program will automatically start with it. Ok, so what if you want to prevent a program from starting every time you start windows? Here is how to do it. 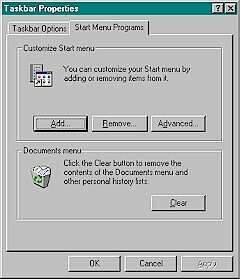 Click on Start - Programs and scroll to the "StartUp" folder. When it's highlighted, RIGHT click on it to bring up the menu. From the menu click on "Explore". 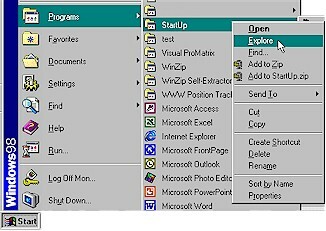 Windows explorer will come up and show the contents of the startUp folder in the right pane. All you have to do is click on the shortcut to the program you want to remove and hit the <Delete> key. Did you know can by pass the launching of ALL the applications in the StartUp folder on a one-time-only basis. This might be handy if you want don't want to wait for the application in the StartUp to be launched, or if you are troubleshooting a Windows start-up problem and you want to eliminate some of the variables. When you start the boot process, wait until you see the Windows logo on the screen, then press and hold the Shift key until Windows finishes loading. The Startup apps will not load. Let's face it -- English is a crazy language! There's no egg in eggplant nor ham in hamburger; neither apple nor pine in pineapple. And why is it that writers write but fingers don't fing, grocers don't groce and hammers don't ham? If the plural of tooth is teeth, why isn't the plural of booth beeth? One goose, two geese. So one moose, two meese? One index, two indices? Doesn't it seem crazy that you can make amends but not one amend, that you comb through the annals of history but not a single annal? If you have a bunch of odds and ends and get rid of all but one of them, what do you call it? How can a slim chance and a fat chance be the same, while a wise man and a wise guy are opposites? How can overlook and oversee be opposites, while quite a lot and quite a few are alike? How can the weather be hot as hell one day and cold as hell another? How you noticed that we talk about certain things only when they are absent? Have you ever seen a horseful carriage or a strapful gown? Met a sung hero or experienced requited love? Have you ever run into someone who was dis-combobulated, grunted, ruly or peccable? And where are all those people who ARE spring chickens or who would ACTUALLY hurt a fly? "Whether you think you can or think you can't -- you're right." A committee is group of people who "keep minutes and waste hours." "People have one thing in common: They are all different." "You can tell whether a man is clever by his answers. You can tell whether a man is wise by his questions"
"The art of reading is to skip judiciously." We certainly hope you find this newsletter useful and entertaining. If you have any comments, send us e-mail by clicking here. This newsletter is produced by Mon Nasser from Engineerica Systems, Inc. My thanks to all those who contributed to this issue: Frank Christ, Karen G. Smith, Nancy Bornstein, and Lady Falls Brown. An article on promoting peer tutoring. February Person of the Month. LRNASST, a listserve for Learning Assistance Professionals. Quotes by Mark Twain, Mother Teresa, Albert Einstein, and others. To read the February issue, click here.